1. Use /kit horse in game. This is a one time thing, so make sure you’re on your island when spawning your horses. 2. 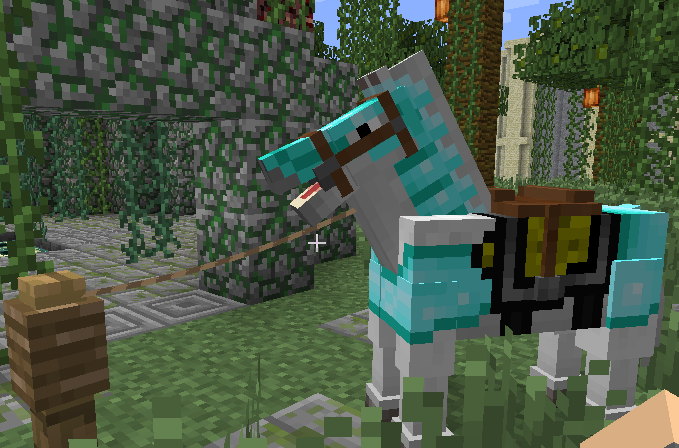 There’s a new villager at spawn named Horse Vendor. It sells all horse related stuff for ghast tears. 3. Finally, for those of you that wish to support the server and help pay the bills, I’ve set up a horse package in Buycraft. It has all 3 horse armor types, 4 spawn eggs, leads and a name tag. You can check it out here: . Thank you! The upgrade to 1.6.2 is finally upon us. After a lot of things happened, mostly unrelated to Minecraft or the servers, I was able to sit down and finish updating all plugins on all 3 servers. The expected downtime for maintenance while updating all servers in the network will be approximately 30 minutes. Update 09:33AM – Main Skyblock server has been updated. Started testing for errors, it’s not yet available to players. Update 09:42AM – Herding Llamas. Maintenance almost done. Update 09:46AM – Maintenance complete. Skyblock server is updated to 1.6.2 and running. Connect and enjoy. In a few hours after getting some proper sleep I’ll update the rest of the servers. For now Survival Games is down until it’s updated. Sorry. This entry was posted in Minecraft Skyblock Server News, Minecraft Survival Games News on July 28, 2013 by heatseeker0. but then what will happen to irish_cc?! What do you mean? If it’s about players needing a newer Java version, I’ll post instructions how to update it. Should be fairly easy. Unfortunately, this means I won’t be on for quite some time. I need to have the Mac store update my computer (believe me I’ve tried everything), but before the summer’s gone I’ll be back! I’ll miss you guys 🙁 I’ll go on Minechat and the forums still though. Perhaps you can update to Java 1.7 instead of the minimum 1.6 required? I can vouch it works well, I have 1.7 64 bit. Actually my computer has to update because it is too old to even update Java. I’ll try your link though. Yay Congratz heat so can you list all the possible way we can get horses? just to say about the bugs as no one has said them. The ones I have found out are. amazing update just a few things to note. Thank you for the bug report. Already plans to address them all, though probably tomorrow will be ready. I’ll be on the server more in the near future. Lots of work in the back, also RL stuff. But that is mostly done.